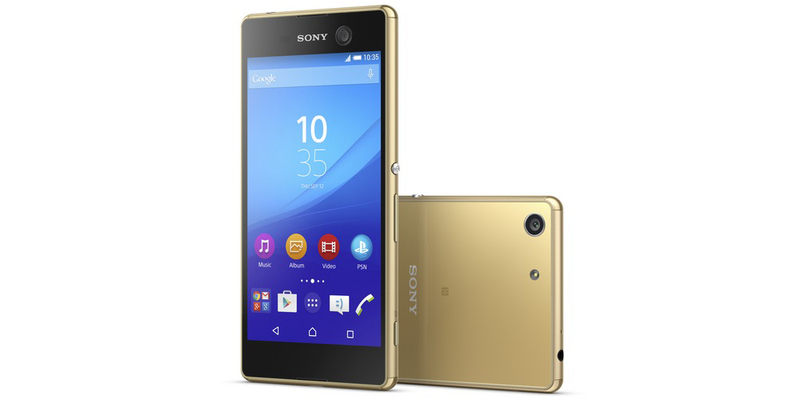 The Sony Xperia M5 was announced today as a "super mid-range" Android smartphone alongside the Sony Xperia C5 Ultra. Both new devices pack powerful cameras and are uniquely designed to please a wide array of users. The Xperia M5 features a 5 inch 1080p display, 16GB of internal storage which can be expanded through microSD, and is powered by a 64-bit MediaTek MT6795 processor with 3GB of RAM. You also get a 2600 mAh battery which keeps the device up and running. 13MP sensor, which comes with autofocus and allows you to record 1080p videos on the go. The Xperia M5 is dust- and water-proof (IP65/IP68), but what's interesting is that its USB port is a capгless one - you won't need to close or open the protective flap when you need access to the port. The handset will be offered in both single SIM and dual SIM variants, with LTE support in certain regions. On the software side, you get Android 5.0 Lollipop, which gets Sony's Xperia UI treatment. You can satisfy all your app needs through the Google Play Store or through Sony's own media channels. Unfortunately Sony is not quite ready to share pricing or availability details of the Xperia M5, but the device is rumored to cost around EUR 360. The phone will be available in black, white, and gold.